Click the image above to view the January 2019 Update! As many of you know we officially put this project on hold back in early 2018, It was a hard thing to do for us as a team. At the time we did not have the man power or the resources to continue working on the project at the same pace many people had become accustom to. Throwing in the legal issues from Bethesda following a member of this project contacting them that was the final nail in the coffin. We were all disappointed and team morale was low, following that legal news many people on the team moved onto other things. Some did not, in the past year since the cancellation announcement a small but dedicated group of people from the original team have continued to slowly chip away at this gargantuan task. Progress has been slow considering the active team is now smaller than 10 people but none the less we cant wait to show you what has been done during that time. “But what about the Voice acting?!?! ?” Well after finding some incredibly talented people we have decided to attempt re-voicing the game, Other audio such as music will have to wait till such a time as we have people capable of dealing with it. Please be patient with us as this is a community project, Everything has and will be done for free. There are no contracts and no one has to work on this. 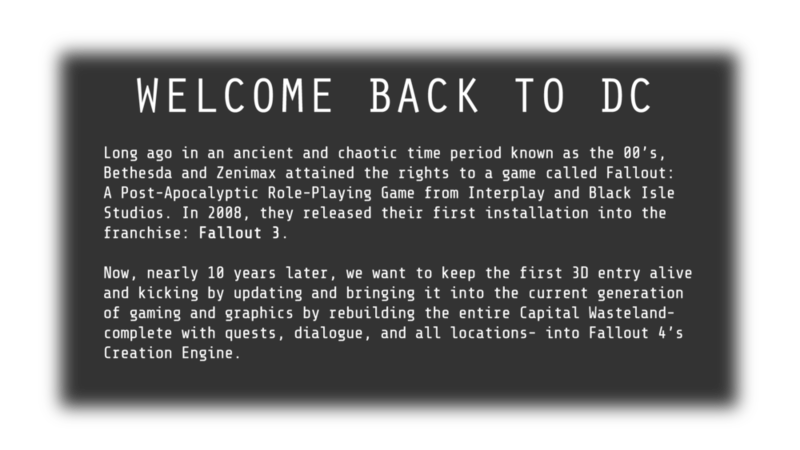 So there it is, The Capital Wasteland project is back on for now. If you have any questions feel free to reach out to me or (Co-Lead)HCGxGrill on twitter. "Official Webpage for the Unofficial Fallout 3 Recreation Project!"